Earthworms and Ascaris lumbricoides are both worms, but they have huge differences. The parasitic roundworm Ascaris lumbricoides creates an illness called ascriasis, which mostly prevails in places where people still use raw human excrement as fertilizer. While both types of worms exist throughout the world, Earthworms are beneficial to the soil, while ascaris is non-beneficial and creates disease in the human body. An adult roundworm lives for about a year in the intestine of a host human and can grow to a length of 8 to 15 inches. Ascaris typically won't cause too many symptoms in the host. Children tend to get re-infected faster by playing in soil, causing the highest infestations. Earthworms, on the other hand, live two to three years but have been recorded to live up to as much as 15 years for some specimens. A single fertilized female Ascaris produces 240,000 eggs daily, which are passed in the feces and live in the soil until a human swallows them. Once a host is infected, the roundworms hatch, become larvae and swim from the intestine to the throat, where they're swallowed and return to the intestine as adults. Earthworms carry both male sperm and female eggs. They pass sperm to each other when both worms line up their sperm receptacle segments. After, the worms move on and a part of their bodies called a clitellum slides forward and deposits eggs into the sperm receptacles, completing fertilization. Being hermaphroditic, a single earthworm can self-fertilize. 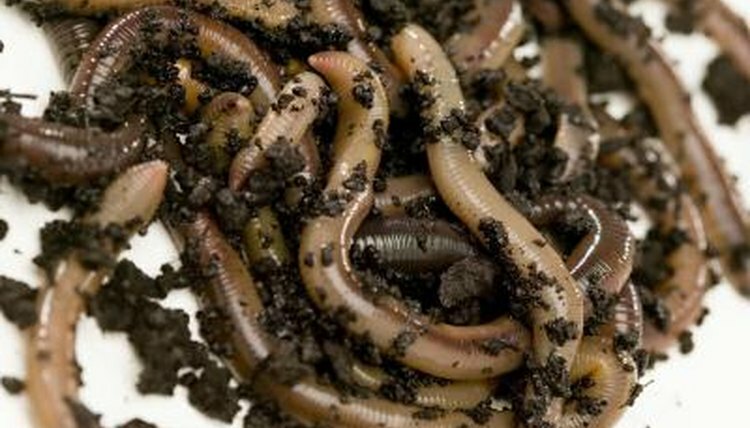 Earthworms are nonparasitic, living their entire lives in the soil, from which they eat. They create more fertile earth from the soil that they consume, by the waste materials they leave behind. In this way, earthworms actually improve the soil. Ascaris roundworms also live a part of their lives in soil, in the form of eggs, but live out the rest of their year-long life span inside the small intestine of a human host. Ascaris generally reach a length of 8 to 15 inches and have an adult diameter of around an eighth of an inch to a quarter of an inch. Earthworms come in a variety of species, most of which are around 4 to 6 inches long. Others reach extreme lengths. One type of tropical earthworm, Glossoscolex worms, reaches 3 feet in length. Another type, called Bimastos parvus or American bark worm, reaches a length of only 2 centimeters.